Panchkula: September 27; Today, The Gurukul, Panchkula hosted a welcome programme for International delegates of 5th International Students Peace Festival organized by Yuvsatta. More than 1000 students from 20 different countries were here for the Peace Fest and for cross-fertilization of ideas through interaction. The crowd-puller of the event was the Gandhi portrayal by Mr. Bernie Meyer as The American Gandhi. 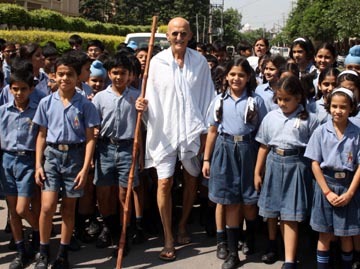 He impressed the students with his Gandhian attire and inspired them to adopt and practice Gandhian values. He interacted with the Gurukulites and also shared Gandhian vision with the international students as well. The “Dandi March” by the American Gandhi around the Sector-20, Panchkula with the students of The Gurukul advocated non-violence and peace. The Gurukulites put up a cultural programme for the foreign delegates. Traditional classical dance, Gandhiji’s Raghupati Raghav, peace songs, “We are the World” etc., and a “Waka Waka” Western dance programme. Belly dancers from Spain as part of the visiting group taught some nuances of belly dancing to the Gurukul girls. Tomorrow, i.e. September 28, 2010, Mr. Justice Mukul Mudgal, Chief Justice of Punjab & Haryana High Court will formally Inaugurate the Peace Fest at GGD SD College, Chandigarh.